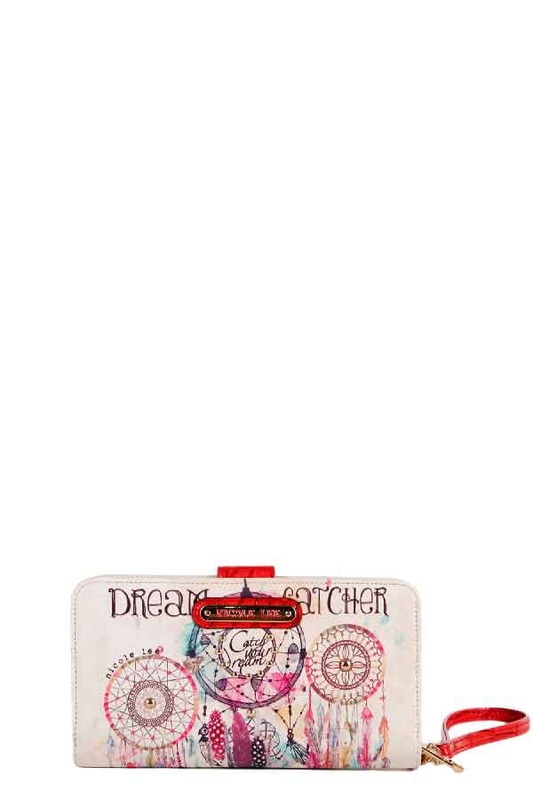 Be ready for summer with the new Nicole Lee Dorothy Dream Catcher Print Wallet. Exterior features: made of faux leather, Nicole Lee’s Dream Catcher print all around, faux croc skin detail, gold tone hardware studs embellishments, button tab closure, side zipper closure and Nicole Lee nameplate in front. Interior features: 2 ID windows, 8 credit card slots, long bill and receipts slots, 1 coin zipper pocket, fully lined. Includes detachable faux leather wristlet with 7” inch drop.